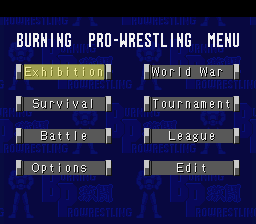 Burning Pro Wrestling is a professional wrestling game for the Super Nintendo. I’ve repatched the game as LunarIPS reported something wrong with the original patch (despite the fact that it works) and I’ve added a readme and some information that I took from the archived website. UPDATE: KingMike has re-repatched the game. 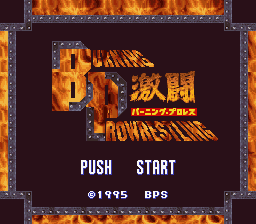 The old patch was made by comparing a headered translated ROM to an unheadered Japanese ROM. 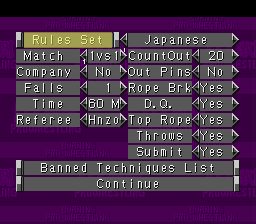 It looks like the translation was also originally made from an over-dumped ROM. So I deleted the header, trimmed the extraneous data and recreated the patch. 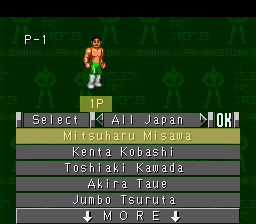 The translation is complete with some words being shortened.